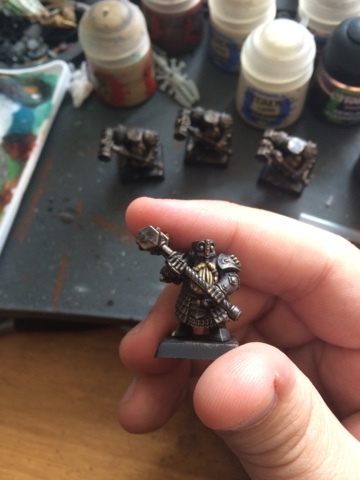 Hello and welcome to this tutorial on painting Dwarf Hammerers. 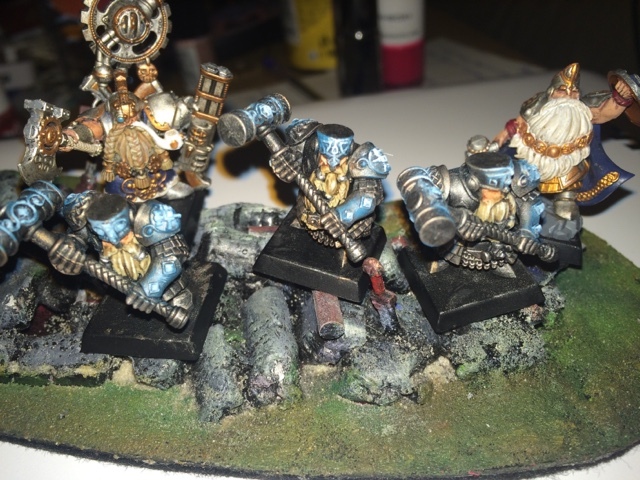 If you are a seasoned veteran of Warhammer Fantasy (WFB) or just starting out you probably know that you have to build, and paint, quite a collection of models to field an effective force on the tabletop. 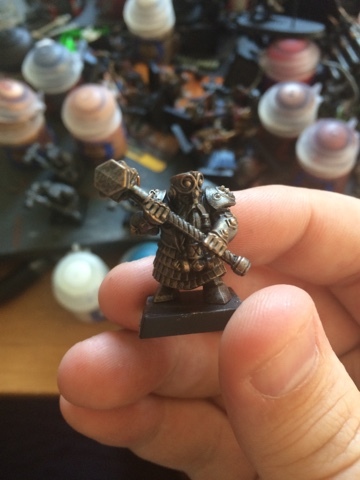 What I would like to share with you today is a quick and easy paint scheme for Hammerers that will allow you to field a nicely painted army in next to no time. This paint scheme should also transfer over to any other armoured unit although you may want to change up the brightness/darkness of the colour scheme to represent the army you're going for. You should be able to work through a lot of models in batches in no time at all. To begin I will quickly list the paints you are going to need, these are all available at your local Games Workshop. 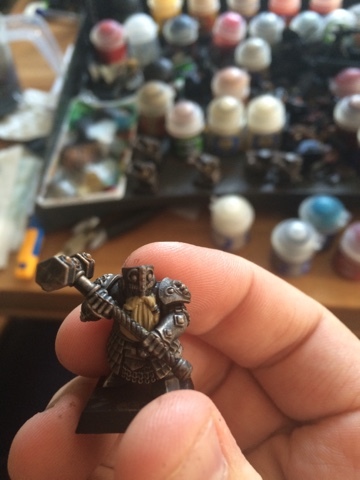 We will start with a base of Chaos Black spray paint and then work up through Leadbelcher, Balthasar Gold, Runefang Steel and a Nuln Oil wash. For the beard we have Zandri Dust, Agrax Earthshade, Ushabti Bone and Screaming Skull. 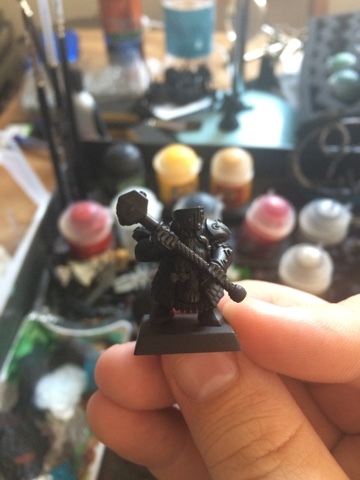 The face requires Cadian Fleshtone and Reikland Fleshshade. 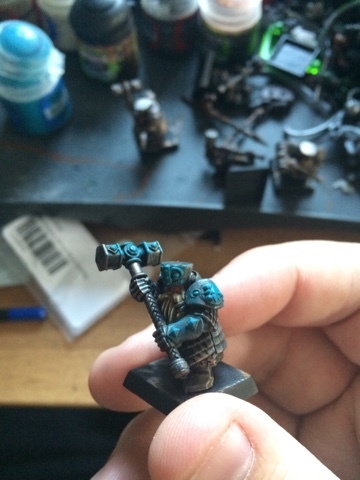 And finally, the glow effect is made with Sotek Green and White Scar. With that done lets get down to the painting. Next up is the Balthasar gold. We are going to dry brush across the whole model but a bit lighter than last time. We want a good coverage of the bronze paint but also for the earlier metal colour to still show through. 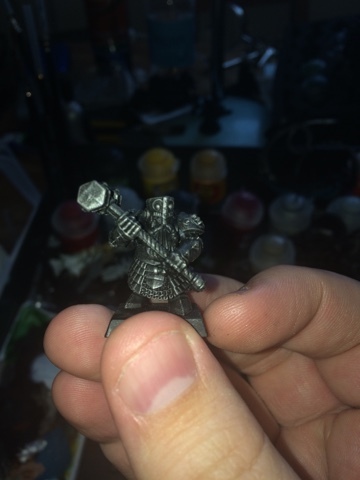 The last dry brush stage for the armour is a very light layer of Runefang Steel. You need good coverage on the model but, again, you want the earlier layers to still show through. The next stage will bring all the layers together nicely. 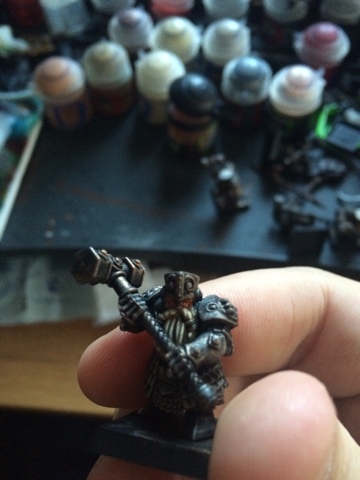 A wash of Nuln Oil across the whole model, using a wash brush, will bring the armour paint scheme all together. Now you want to use your standard brush to paint a base layer of Zandri Dust across all of the beard area. 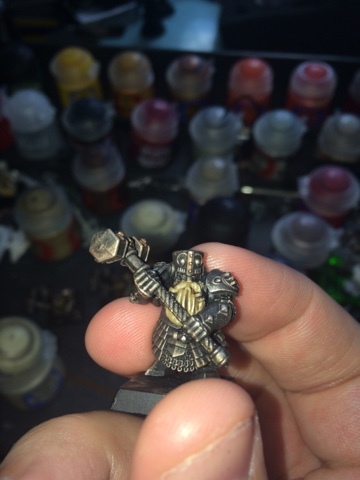 Keep it neat around the armour, perhaps switching to a detail brush to make sure you don't cross over onto the armour. 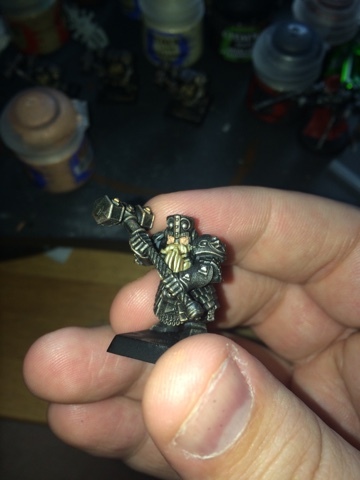 Clean your standard brush and prepare an Agrax Earthshade wash. Cover the whole beard area, making sure that it settles in the recesses but doesn't run onto the rest of the model. Grab yourself a fine detail brush and paint some ushabti bone on the raised areas of the beard, this will add some depth to the beard. Finally highlight the ushabti bone with some screaming skull. You don't want to cover all of the ushabti bone, just work along the most raised parts to add a final layer of depth to the beard. It is possible to do other beard colours in a similar style and I will cover these in another tutorial at a later date. Paint Cadian Fleshtone on the areas of the face that you can see with a fine detail brush. 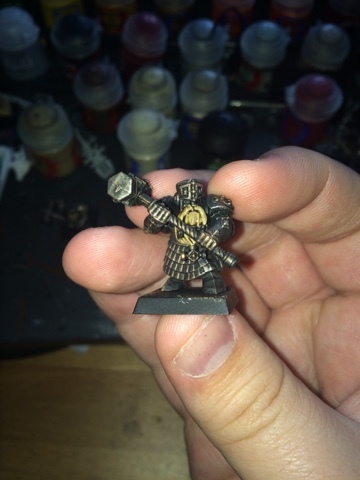 Next you want to wash the face with Reikland Fleshshade but be careful not to run over onto the armour or the beard. You then want to highlight the raise areas with another layer of Cadian Fleshtone. 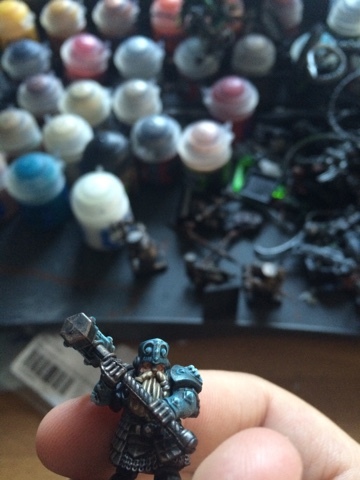 Now we move onto the glowing runes on the Hammerers armour and weapons. 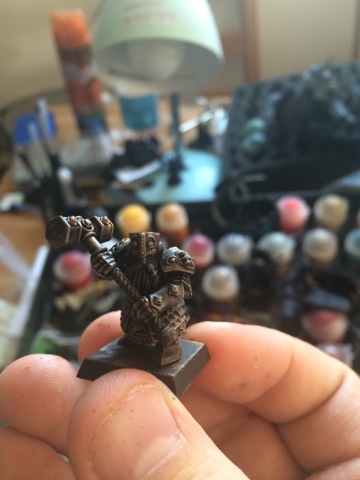 Grab your dry brush again and work the Sotek Green into the bristles before clearing most of it off on some kitchen roll. 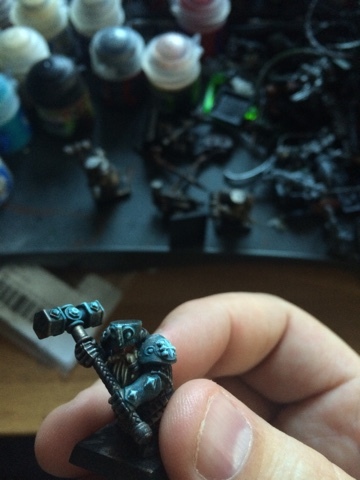 Lightly dry brush the Sotek Green onto the front of the helmet, shoulder pads, top of the gauntlets and the detail on the hammer. 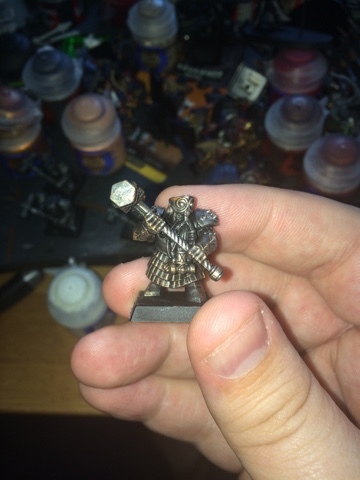 This will form the base of the glow effect. It can also be accomplished with an airbrush. The last part of the paint scheme is to lightly dry brush white scar on top of the Sotek green. Focus on the centre and work out towards the edge of the blue/green glow. You don't want to cover it but enhance the glow effect with the White. It takes some practice but once you get it down the effect is quite impressive. Thanks for sticking with me through to the end and I hope you have found it useful. If you have any questions or comments please feel free to leave them below (or on any of the other platforms available) and I will get back to you as soon as I can!